A wooden road is visible at the edge of this undated photo from the Allegan County Historical Society's plank road file. It was likely taken in Plainwell. Dean Knuth noticed it years ago: a marker on Douglas Avenue in semirural Kalamazoo County, in the front yard of an old brick house near the Allegan County line. A metal plaque on a stone remembers the "old toll gate” on the road to Grand Rapids. This wasn’t just any toll road. It was a plank road - one of hundreds of wooden roadways built in the U.S. in the 19th century. The plank roads made travel quicker and easier (if not always safer), and yet they struggled to stay in business. A report on the rise and fall of "Kalamazoo's Wonderful Washboard," the plank road. According to the marker this toll, built in 1852, closed just 16 years later. “I don’t know why it got started and stopped when it did, and I’ve driven by it for years and haven’t had a chance to ask the question," he said, standing just off Douglas Avenue on a rainy morning in March. Dean also wonders about the old brick house behind the marker, and whether it played a role in plank road history. Before we answer that question, we head to the Allegan County Historical Society in downtown Allegan for some background on traveling in Southwest Michigan in middle of the nineteenth century. 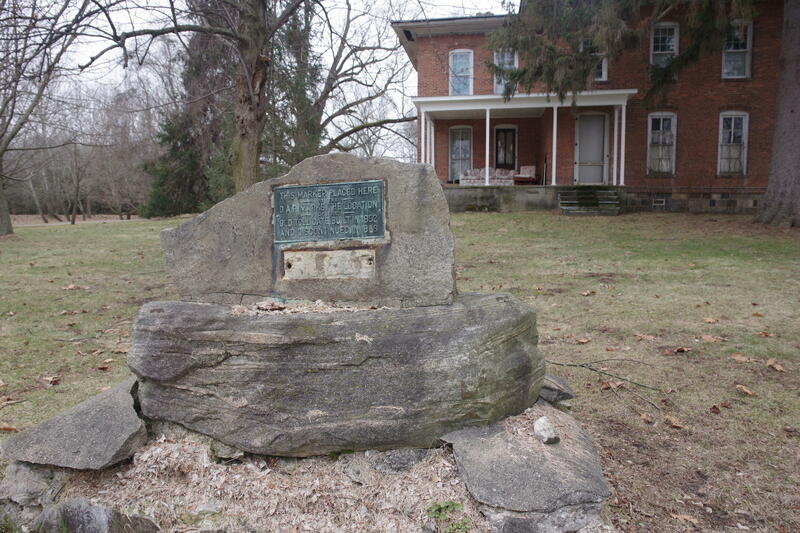 The marker placed by the Hannah McIntosh Cady chapter of the Daughters of the American Revolution at the tollmaster's house on Douglas Ave. near Plainwell. “The road between Grand Rapids and Kalamazoo was a nightmare in those days,” the Historical Society’s Mark Lovett said. He added that before the plank road, there was no direct route to Grand Rapids. And as on other unfinished roads, travelers would have faced dust, ruts and axle-swallowing mud. Lovett said people tried various improvements, starting with the boggy spots. “They would throw in brush and logs and stuff and they would drive over that and then they refined that by doing what they called corduroy roads which were more just logs laid,” he said. Then people started edging the logs to make a smooth surface. “But then the plank roads came along, then what they’d do is put a stringer on either side running parallel to each other and put the boards across it,” he explained. Voilà, a dry-ish, even road. Sounds great, but who’s going to build it? Not the state, which regulated highways in the mid-1800s but did little to provide them, according to the Michigan History Center. It mostly fell to private companies to build Michigan’s plank roads. That’s why many of them had tolls - so their shareholders could hopefully earn a dividend. Kalamazoo had two wooden roads. One went most of the way to Three Rivers. The other went from Kalamazoo to Grand Rapids. Completed in 1855, it cut travel time between the villages in half - from two days, to just one. One of the stops on that road was on Douglas Avenue by a brick house. It's the site of the marker that caught Dean’s eye. “It’s a very unique house,” says Paul Sugas. He and his wife Penny live there now, and over the years they’ve put together a file of articles and historical documents on the toll road. Paul Sugas says the toll gate itself was impressive. “It’s described as a covered barn that went across the road, and it had a draw,” he says. The house was the official tollmaster’s residence. “During the seasons of 1855 and 1856, A.P. Ware and his wife Anna kept the toll gate and sold tobacco, cigars and beer to wayfarers,” according to one account in the Sugas' file. Another view of a wooden road, also most likely in Plainwell (and possibly of the same house from a different angle and in a different year). Things could get tense on the road. Dean reads from the recollections of a descendant of the Wares. “Plank road etiquette required that the lighter load was supposed to leave the road and let the other one pass, which sometimes meant that they’d get stuck in the mud. So they occasionally would have some pretty contentious confrontations between people hauling things." Dean wants to know why the Kalamazoo to Grand Rapids toll road didn’t last longer. First, it appears that the investors, like other plank road owners around the country, got swamped by the cost of keeping up the surface. Claims that the roads would last for years with few repairs turned out not to be true. Many only turned a profit for a few years. Then they became a financial burden for the companies that owned them. Also, as Kalamazoo got more and more train service and the plank road became less essential, investors had another reason to abandon the tolls, which they did in the late 1860s. The failure of the plank roads was tough on people like Epaphroditus Ransom of Kalamazoo County, the namesake of Ransom Street and Michigan’s seventh governor. Lovett of the Allegan County Historical Society said Ransom was big on plank roads. This led Dean to observe that "governors and road infrastructure in Michigan have been inextricably linked for over a century." According to a 1950 history of the Kalamazoo plank roads by Kalamazoo College’s Jack Porter, the toll could be suspended for riders on their way to a funeral, for church-goers on the Sabbath, for people who were traveling to appear in court and for those on their way to a military parade. Some 19th-century toll roads suffered from “shunpikes,” or illegal shortcut roads that bypassed the gates. Humorist and novelist Mark Twain supposedly rode the plank road from Kalamazoo to Grand Rapids on his way to a lecture. He is said to have complained that the road would have been more comfortable to travel ‘if some unconscionable scoundrel had not now and then dropped a plank across it.’ Several sources share a version of this quote without a date or other documentation to verify it. However, according to steamboattimes.com, Twain toured several states including Michigan between November 1868 and March 1869. At the time, the Kalamazoo to Grand Rapids plank road was in bad shape, and the Grand Rapids and Indiana Railroad line from the south into Grand Rapids was not complete (and wouldn’t be until the fall of 1870). Thus, it is plausible both that Twain took the plank road and that he complained about it. Collection of the Harvard Medical School, Harvard University, Cambridge, MA, courtesy of the Office of the Chief Medical Examiner, Baltimore, MD.